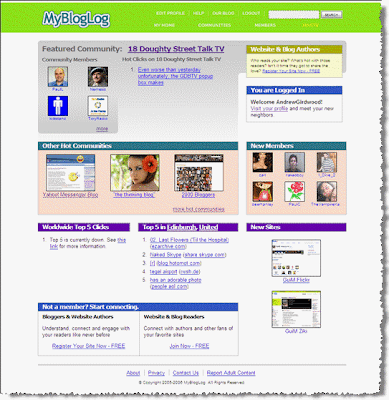 MyBlogLog have updated their homepage. I like the look. 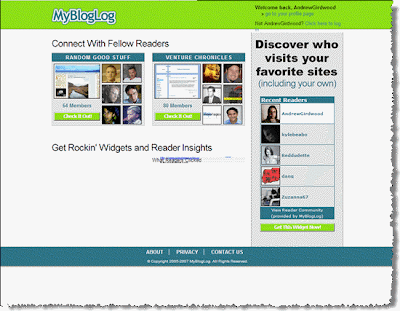 The static sample of MyBlogLog output has been removed and the homepage now looks to be much more dynamic. I'm glad they kept the new members section but as I use MyBlogLog to watch my daily stats (and Google Analytics for trends) I'm shown Hot Communities (my members') all the time. The WorldWide Top 5 link clicks is going to be a powerhouse. People will fight over this section for the traffic it could deliver. As a user I enjoy spotting break buzzes out the internet and often wish there was a setting in Google Reader to have it go fetch updates more often! With this uber-top five we have another way to spot KIBs (Key Influencing Blogs) for social media strategies. I assume the Top 5 in Edinburgh are the top five links clicked by users in Edinburgh. That seems like the only way .de sites could get there. Clicking on the "Edinburgh" or "United Kingdom" links takes us to maps.mybloglog.com. This is new. Well. New to me. The new homepage seems to have come at a time where MyBlogLog's servers are struggling (Both Yahoo Pipes and MyBlogLog, the newbies, have this problem) and this second screen grab shows the MyBlogLog home as it is for me right now. It's the old style and most of the contents have crumbled into a small section in the middle. With a bit of luck MyBlogLog's servers will recover and we can go see what MyBlogLog's Maps sub-domain is all about. Hopefully it's a geo-overview of blog communities. I predict a lot of MyBlogLog communities around the Philippines and Thailand.